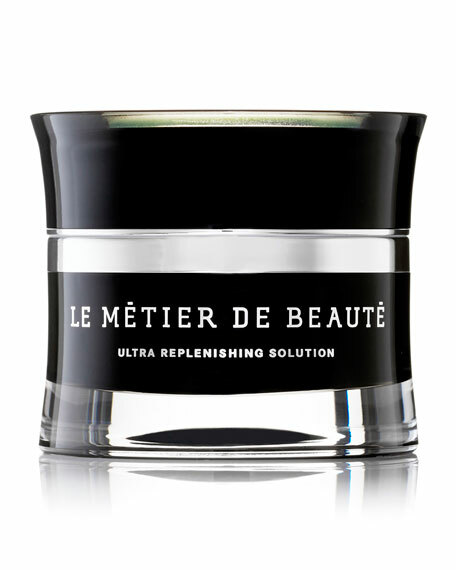 Le Metier de Beaute Ultra Replenishing Solution, 1.7 oz. Ultra Replenishing Solution is a highly emollient cream designed to condition and hydrate while it nourishes and detoxifiesthe formula normalizes the skin's moisture content to provide unparalleled suppleness. HOW TO USE: Apply once or twice daily to face. Take a small amount of product with your fingertips and massage over the entire face, avoiding the eye area and hairline. For optimal results, use after cleansing and with any Le Métier de Beauté anti-aging treatments such as the Rejuvenating Anti-Aging Night Crème or Revitalizing Anti-Aging Day Crème (both sold separately). For in-store inquiries, use sku #1972686.